Why does my Windows desktop look weird on my HDTV? It can be terribly frustrating to run a cable from a good HDTV to a PC graphics board and get skewed proportions, faded colors, and slightly blurry images. Your HDTV might not perform well as a monitor for several reasons. First, many HDTVs aren't designed to display fine details (such as text and lines) at close distances, but to display smooth motion and vibrant colors from distances of up to 5 feet away. Some HDTVs are configurable for use as PC monitors, however, so check to see whether your HDTV has an 'Alternate Monitor' display setting, or something similar. 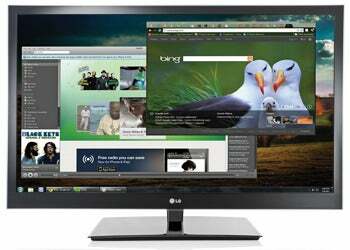 Second, the native resolution of your HDTV may not match your Windows desktop as configured. For example, if you hook up a 42-inch LG 42LH50 HDTV with a native resolution of 1920 by 1080 (1080p) to a PC running the widescreen version of the same resolution (1920 by 1200), everything on your desktop will look a bit stretched out and weird. For optimal picture quality, you must configure your PC to match your HDTV's native resolution and disable any of your HDTV's features that may interfere with the PC video signal (scaling, overscan, and the like) and thus degrade picture quality. Third, an older graphics board driver may assume that an HDMI connection must be to a TV, and it may react by underscanning the image from your PC to fit it within the borders of the display, making your Windows desktop look squished on a big 1080p PC monitor. To correct this problem, open the control panel for your graphics board and disable the underscan feature. Finally, using an analog VGA cable to connect your HDTV to your PC can allow noise or other interference to disrupt the signal coming from your PC, thereby worsening the screen's image quality. For best results, use a short HDMI cable to connect your HDTV and your PC. What is UEFI, and why should I care? The Unified Extensible Firmware Interface is a new firmware interface specification that is designed to replace the familiar BIOS interface. When you turn on your computer, UEFI's firmware will run an inventory of the hardware installed on the system; after checking that everything is functioning properly, it will launch the operating system and turn control of the PC hardware over to the software (and to you). UEFI supports a wider range of chip architectures (including 32-bit and 64-bit processors like the ARM chips that will be in Windows 8 tablet PCs) than does BIOS, which is limited to running on 16-bit processors. The new spec works very well, and nearly all UEFI firmware images in­­clude support for older BIOS services, so you should never have a problem upgrading from a motherboard flashed with BIOS to one flashed with UEFI. What is 'Free Public Wi-Fi,' and why doesn't it ever work? The "Free Public Wi-Fi" network you see in various public places is the result of an old Windows XP bug that causes the OS to set up an ad hoc data-sharing network for connected PCs if it can't connect to a trusted wireless network automatically. Windows names the ad hoc setup after its previous Wi-Fi network connection. Long ago, after failing to connect to a trusted network named "Free Public Wi-Fi," a Windows PC created just such an ad hoc entity. Drawn by the word "Free," local laptop users hoping to get online connected to the impotent ad hoc network, and thus began broadcasting (and perpetuating) it themselves. Connecting to this type of device-to-device ad hoc network rarely poses any immediate danger, but it won't get you onto the Web, either. And malicious users could spy on the connection and steal valuable information from you. To ensure that your PC isn't inadvertently broadcasting an impotent ad hoc network, update it to at least Windows XP with Service Pack 3. If you run Windows Vista, 7, or 8, you have nothing to worry about; nevertheless, avoid connecting to open Wi-Fi networks with names like "Free Public Wi-Fi" or "Default." Why can't I upgrade from 32-bit Windows to 64-bit Windows? Upgrading a copy of Windows 7 from 32-bit Home to 32-bit Professional is simple enough, but upgrading to a 64-bit version of the OS re­­quires you to do a fresh installation. Windows handles information differently depending on whether you use the 32-bit or 64-bit version. In extremely broad terms, a 64-bit operating system can process data in bigger chunks than a 32-bit system can. That's why you can't use the Windows Easy Transfer utility to move files and applications between 32-bit and 64-bit versions of Windows: The CPUs on the transferring and re­­ceiving machines use fundamentally different data architectures. Moving from 32-bit to 64-bit Windows also entails upgrading to 64-bit versions of your applications--and most programs won't work any better afterward. The main reasons to upgrade from 32-bit to 64-bit Windows are to take advantage of a 64-bit processor (which most modern PCs have) and to use more than 4GB of RAM. If you don't have that much RAM, upgrading to 64-bit Windows may not be worth the hassle. 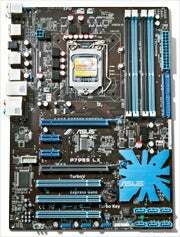 Next: Why isn't my motherboard beeping at startup?